I just finished watching a 4-5 minute web video. The guy, a nice enough fellow, mentioned that if you post a video, keep it short as people, in general, tend to have a short attention spans. While he is correct, it doesn't have to be that way... it helps if you have interesting content, very interesting content. Too often the presenter is trying to get the words out, look professional, and trying not to look like he or she is reading a script (or remembering the words!!!) 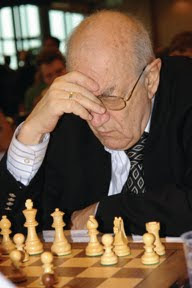 What if the speaker was Mikhail Tal (from some discovered recording) or Viktor Korchnoi? Yep, it's a lot easier to pay attention. Plus, these guys are experts, they aren't handing you a baloney sandwich. Plus, they are a little ornery. But VOICE helps also. Some people, with highly pitched voices, are usually hard to listen to. I observed this about Edmar Mednis. Danny Kopec puts me to sleep. Others, because they are immigrants, are not always easy to understand. It wouldn't have been a sin to have used someone else, but, that's added expense and they might need training in the art of chess speak. Chess seems to have NO money. And at times, some people are just hard to look at. But Seirawan in a suit, easy to look at. But when he starts talking about alien civilizations, who wants to look or listen? I recall going into a steakhouse in Galesburg, IL several years ago and I was greeted by a gentleman at the door and I said to him, "You should be in radio." He said, "I was, for years." Ever heard of Earl Nightingale? What a voice! He led the way in selling success on tapes. He had a voice to kill for. (Same with Sam Elliott in the beef commercials, or Gregory Peck before him.) Lower voices tend to be heard better than other types of voices as long as the enunciation is there. Some women do very well with their natural voice... but not all of us have sound engineers. Watch the ChessBase videos (I've seen many), and drop me a line in the box below as to who is YOUR favorite. Not the best chess player, but who speaks so well you don't mind hearing him. Myself, I like Martin & Davies because they are generally clear and have an authoritative voice with a little humor tossed in. But who is (are) easy for you to listen to? Photo by friend Harald Fietz. 1. They know the material and come prepared. They know the limitations of the medium and so work within those limits. It isn't like a book where a single position can have 8 or more lines exhaustively analyzed. 2. They have done some rehearsing and so the transition points are smooth. Just giving the same talk two or three times will eliminate a lot of the "uhs", "ums" and "ers" which plague all public speakers. 3. They are enthusiastic. Some of the presenters take on a bit of an academic detachment and so can sound like a dry lecture they are being sentenced to give as part of a plea bargain. 4. Accents aren't a big factor for me so long as the speaker is clear. Usually if they are working from a script and the syntax is straightforward the accent isn't important. Hearing some of the greats like Shirov, Korchnoi, etc in their own voice is part of the fun of having a celebrity presenter.